Planning a kids birthday party with a construction theme. Why not make your own fun invitations with a 'let's get building' feel to them. Some of the ideas here would suit a Bob the builder party or a Tonka construction party as well. Buy some small cheap set of tools like screwdriver or spanner set. They can be real tools or toy tools. Write out your invitation details onto a small card or tag, punch a hole in the tag, thread it on to some twine and then tie it to the tool. You can get your son (or daughter) to hand them out to their friends at school. Cut your invitation card into the shape of a toolbox or hard hat and embellish the inside of the card with stickers of different tools and building supplies. Take phrases from popular science fiction movies, books and programs. Foreman Blake wants you for his construction crew! 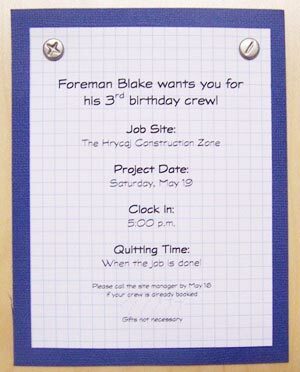 This a invitation for a Tonka truck/Construction themed birthday party. It is simple enough to make. Blue bazzill cardstock but you can use any card. The invitation party details are typed on scrapbook paper but you can use paper from a school mathematics book or even ledger paper to print on. Once printed I stuck it down on to the blue card with a glue stick. 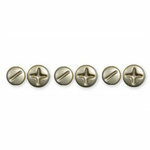 The only embellishment is the two screw brads that you can get from scrapbook.com via the link below. They added the perfect finish to the invitations.